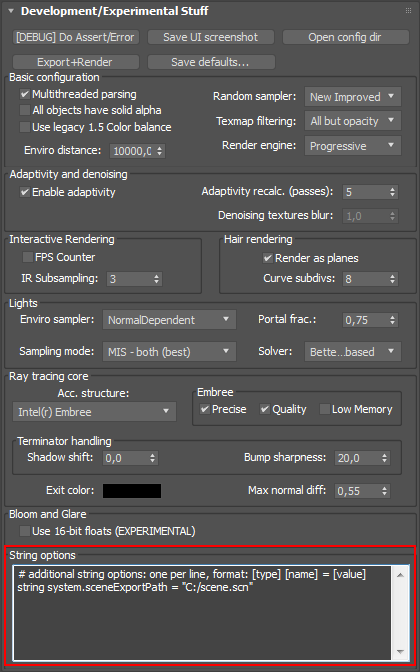 You can find string options in Render Setup > Performance > Development/experimental stuff. They work the same as .conf files, and can be used to set additional parameters, which do not have direct GUI controls. Makes the Corona DR slaves use all but single thread. The number of threads used on slaves is a different parameter from the regular number of threads, so by default all slaves use all available CPU cores. If you for some reason need to change this, you can use this option to set up the number of threads manually. Same semantics as for regular number of threads apply (0 is unlimited, positive numbers are number of cores used, negative numbers are numbers of cores left idle). Changes light size in the custom material editor preview. Default value: 1.0. Changes light intensity in the custom material editor preview. Default value: 1.0. Changes the font size of VFB render stamp. Default value is 8. Sets the Corona worker threads priority. This is the replacement of the removed "low thread priority" switch. Allowed values are Low, BelowNormal, Normal, AboveNormal, High. Default value is Low. Disables antialiasing for the beauty pass, and all other render elements.